The emergence of the tank in World War I led to the development of the first infantry weapons to defend against tanks. Anti-tank rifles became commonplace in the inter-war years and in the early campaigns of World War II in Poland and the Battle of France, which saw renewed use in the form of the British .55in Boys anti-tank rifle - also used by the US Marine Corps in the Pacific. The French campaign made it clear that the day of the anti-tank rifle was ending due to the increasing thickness of tank armor. Nevertheless, anti-tank rifles continued to be used by the Soviets on the Eastern Front with two rifles, the 14.5mm PTRS and PTRD, and were still in widespread use in 1945. They served again with Korean and Chinese forces in the Korean War, and some have even appeared in Ukraine in 2014-15. 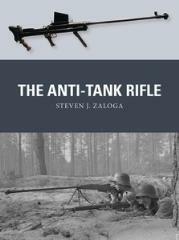 Fully illustrated and drawing upon a range of sources, this is the absorbing story of the anti-tank rifle, the infantryman's anti-armor weapon during the world wars.